It was always a stretch to believe that there was enough room in France’s government for both Arnaud Montebourg and Manuel Valls. Montebourg, who represents the unapologetically socialist wing of France’s Parti socialiste (PS, Socialist Party), received a promotion in April as economy minister when French president François Hollande reshuffled his cabinet and replaced former prime minister Jean-Marc Ayrault with Valls. At the time, it was hardly clear that Montebourg deserved it after picking fights with prominent foreign businessmen in both the United States and India and waging an avowedly protectionist ‘Made in France’ campaign while serving as minister for industrial renewal. 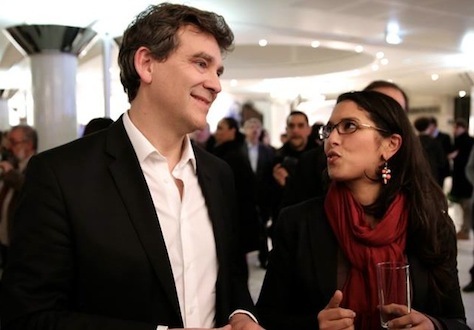 Montebourg (pictured above), with a charming grin, trim figure and a wavy swath of dark hair, who last weekend shared a photo of Loire Valley red wine on his Facebook feed, fits neatly into the American stereotype of the preening, tiresome, French socialist. Valls, meanwhile, is leading Hollande’s government at a time when the Socialist administration is turning even more to the center, with a much-heraled (if hokey) ‘Responsibility Pact’ that aims to cajole French businesses into hiring a half-million new workers with the promise of a €40 billion payroll tax cut, financed by an even greater €50 billion in spending cuts. Though he’s regularly touted as a reformer, it’s more accurate to say that the Spanish-born Valls is a tough-minded ‘third way’ centrist who wants to rename the Socialist Party, which he considers too leftist. As interior minister, he showed he could be just as tough on immigration and crime as former conservative president Nicolas Sarkozy. When he became as prime minister in late March, Valls had the highest approval rating by far of any cabinet member. Today, his approval is sinking fast — an IFOP poll last weekend gave Hollande a 17% approval rating and Valls just 36% approval. But Valls always had the support of Hollande and allies like finance minister Michael Sapin, and it was clear even in the spring that Montebourg was destined to become more isolated than ever in the Valls era. It took less than five months for the cabinet to rupture. Montebourg publicly challenged Hollande over the weekend to rethink his economic policy in light of new data that show France’s economy remains stagnant — growing by just 0.1% in the last quarter, far below Hollande’s already-anemic target of 1%. Montebourg has also criticized Germany for encouraging austerity policies throughout the eurozone that he and other left-wing European politicians and economists blame for weakening the continent’s economic growth since the 2008-09 financial crisis. In response, Valls orchestrating a dramatic resignation on Monday morning, though Hollande has given him a mandate to form a new government that won’t include Montebourg or allies like education minister Benoît Hamon and culture minister Aurelie Filippetti. The drama surrounding this week’s reshuffle is hardly welcome so soon after Valls’s initial appointment, and Hollande risks a wider revolt on the French left that could endanger his agenda in the Assemblée nationale (National Assembly), where Socialist rebels could join legislators from the center-right Union pour un mouvement populaire (UMP, Union for a popular movement) in opposition to his agenda. Valls will introduce the 2015 budget in the autumn, and if he fails to pass it later this year, his government could fall and Hollande might be forced to call snap elections that the Socialists would almost certainly lose. The Socialists control 280 seats and, with their leftist allies, an aggregate 331 seats in the National Assembly. But they’d lose many of those if elections were held anytime in the near future, making ‘cohabitation’ — the French term for divided government — a real possibility. The idea of a right-wing majority or, worse, a Hollande-led ‘grand coalition’ government of the kind that now governs Germany, will for now likely keep Montebourg and the leftist rebels from bringing down the next Valls government. But it’s by no means certain when there’s so much to gain from opposing someone as widely unpopular as Hollande. Currently, the French right is even less united than the French left. Absent Sarkozy’s leadership, the UMP is divided between a conservative wing led by former UMP president Jean-François Copé and a moderate wing led by Sarkozy’s former prime minister François Fillon. Elder statesman Alain Juppé, the first prime minister of former president Jacques Chirac from 1995 to 1997, convicted of corruption in 2004 and rehabilitated as Sarkozy’s second foreign minister in 2011, declared his intention to run in the UMP presidential primaries in 2016, where he could face Sarkozy, Fillon, Copé, and others. UMP division comes as Marine Le Pen is successfully maneuvering her far-right Front national (FN, National Front) closer to the mainstream of French conservative politics, in part due to the UMP’s increasingly conservative tilt on issues like immigration and gay rights. Astonishingly, midsummer polls show that Le Pen holds a very narrow lead in surveys for the first round of a hypothetical 2017 presidential election against Sarkozy and Hollande. Despite the risks, Hollande’s latest move signals that he believes his new approach of doubling-down on budget discipline, instituting payroll tax cuts and embracing a more conciliatory tone with French business is the correct course. Though Hollande came to office in 2012 on a broadly anti-austerity platform, promising to institute economic policies to stimulate jobs and employment, he quickly confirmed that he would trim the French budget as necessary to keep the deficit less than 3% of national GDP, the eurozone limit, quickly angering leftists both inside and outside of the Socialist Party. Last year, Hollande’s government actually lowered the deficit to just 2% of GDP. Nevertheless, Hollande’s full-throttle attempt to enact a 75% tax on incomes over €1 million alienated the French right and an investor class that howled against what would have been one of the highest personal income tax rates on either side of the Atlantic. The fate of that effort remains unclear after complications in the French judiciary. Those stumbles, in addition to an economy still struggling to achieve real growth — and the embarrassing distraction of Hollande’s tumultuous love life over the past two years — have made Hollande the most unpopular president in the history of the Fifth Republic. Montebourg preemptively ruled himself out from serving in the next Valls government on Monday during comments that again fiercely condemned Hollande’s economic policy, pointing to the latest low-growth figures and to signs that the eurozone may be headed into a period of deflation. He also compared himself to Cincinnatus, the Roman general who refused imperial power to return to his simple country farm, the example often cited in reference to the first US president George Washington, who refused, in the wake of the successful 18th century American revolution, to retire from political power. But, at age 51, Montebourg has now become the most prominent leader of the party’s left wing after placing third in the October 2011 Socialist Party primary that ultimately launched Hollande to the presidency. In that race, Montebourg eclipsed both Valls, the current prime minister, and Ségolène Royal, the party’s 2007 candidate and Hollande’s former partner. Montebourg’s credibility with the radical French left and the country’s labor unions ranked him among the reasons that Hollande initially gave him such a prominent role in his cabinet. What’s more, grandstanding against Anglo-American businessmen and attacking German chancellor Angela Merkel and the politics of austerity are politically popular. Nevertheless, Montebourg’s concerns aren’t just leftist populism. France’s public debt is hovering at around 93% of GDP, and though Hollande’s government reduced it slightly last year, most economic analysts believe that’s still too high for a country with an aging workforce, a declining birthrate and exorbitant social welfare obligations. Nevertheless, Montebourg and others have questioned whether it’s the most appropriate time to prioritize debt reduction over economic growth. Mario Draghi, the European Central Bank president, certainly no radical socialist, is increasingly worried that the ECB may need to take extraordinary measures, possibly some form of quantitative easing, to counter growing deflationary expectations. France’s economic malaise leaves Hollande and Valls in a ‘damned-if-you-do, damned-if-you don’t’ quandary: either trim the budget deficit to keep borrowing costs low and maintain bondholder confidence, or spend widely on public investments and infrastructure in an attempt that may or may not succeed in jump-starting more robust growth. Though much of Hollande’s political pain is self-inflicted, he came to office two years ago in an unenviable position. Meanwhile, Montebourg’s feud with Hollande is cresting while another firebrand of the French left is backing away from the spotlight. Jean-Luc Mélenchon, a member of the European Parliament, who finished fourth in the last presidential election, announced that he would step down as one of two co-presidents of the Parti de Gauche (Left Party). A former Socialist, Mélenchon served as minister for vocational education under prime minister Lionel Jospin between 2000 and 2002. Mélenchon emerged as a popular voice of protest in the Sarkozy era to pension reforms that raised France’s retirement age, and he articulately challenged Le Pen in the constituency of Hénin-Beaumont in one of the most high-profile contests of the June 2012 parliamentary elections. In the past two years, Mélenchon has sparred with other parties within the ‘Left Front’ that includes everything from disaffected Socialists and green politicians to the remnants of France’s once-powerful Parti communiste français (PCF, French Communist Party). For now, despite his criticisms of the Hollande administration, Montebourg still supports the Socialist government. But like Mélenchon, Montebourg will benefit from the high profile of a former minister, now freed to snark at will from the National Assembly backbenches. Also like Mélenchon, Montebourg favors constitutional reforms that would usher in a new Sixth Republic, and he could ultimately challenge Hollande from the left in 2017, playing the same role that Mélenchon did in 2012. Far from cauterizing his party’s troubles, Hollande and Valls may have opened the sutures even wider by expelling Montebourg and his leftist allies from government. Previous PostLeft hopes to make eastern breakthrough in German state electionsNext PostWhat if Abkhazia held a presidential election and no one cared?